" The ultimate aim of Karate lies not in victory nor defeat, but in the perfection of the character of the prarticipants "
Has been teaching in Killeen since 1997. Has extensive training in Shotokan Karate. He distinguishes himself from other instructors due to his training in many Japanese martial arts such as Kendo, Iaido, Aikido and Karate. 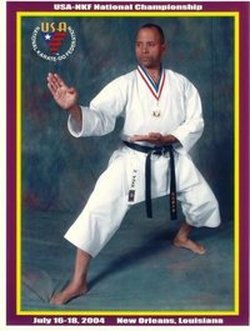 He is a former National Karate champion 5 times in the USA and has trained many students to become black belts and National Champions as well. His passion is teaching karate to anyone, his joy is to see the transformation that occurs in each of the students and how and become outstanding citizens. 2009 Gold Kata, National Champion,USA-NKF Nationals,July 2009, Florida. 2009 Silver Kumite, USA-NKF Nationals, July 2009, Ft Lauderdale, FL. 2005 Bronze Kata USA-NKF Nationals July05. 2005 Silver Kumite USA-NKF Texas Qualifier May05. 2005 Bronze, Kendo Nabeshima Cup April 05. 2004 Silver Kumite and Kata, 40th All South Karate Tournament April04. 2004 Gold Iaido, USA-NKF National Champion Jul04. 2004 Bronze Kata, USA-NKF Nationals July 04. 2004 3rd place, Kendo Team competition Oct 2004. 1995 1st place, Kumite Champion, City Tournament in Yamato-City, Japan.